Bheas and Marcus Gone have a lot stacked against them. Their mother, Nicole Gone, contracted Type 2 diabetes at 13 years old. She and her husband both have long family histories of Type 1 and Type 2 diabetes. For Bheas, Marcus and her other two children, this makes their chances of contracting the disease, which can be tied to genetics, exponentially high. Nicole will do anything to keep this family epidemic from happening with this generation. But she knows how hard it is. 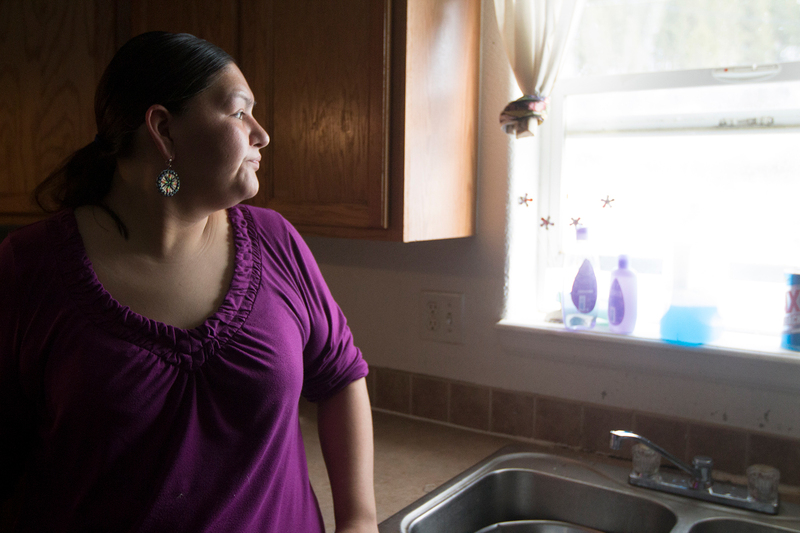 Gone, 30, grew up on the Fort Belknap Indian Reservation, in the middle of a food desert. When she was diagnosed with diabetes, her family visited multiple nutritionists, who told her parents that their children needed to eat more fruits and vegetables. The disease is the result of the body not processing insulin properly. It loses the ability to burn sugars, including those in carbohydrates, and can cause a variety of symptoms from dizzy spells and frequent urination to blindness, and can result in amputated limbs and death. The disease is preventable and treatable, but requires a complete lifestyle change for many people, changes that are hard to achieve in low-income and rural communities or food deserts. 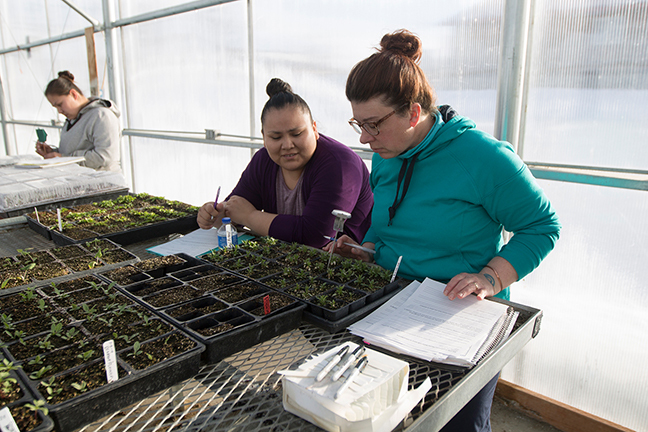 Students take notes on changes in their plants for Cheryl Morales’ ethnobotany class. All students are asked to note the environmental conditions of the greenhouse, the times of sunrise and sunset, moon phase, and other observations of the growth cycle. The Fort Belknap Indian Reservation has, for decades, been considered a food desert, which the United States Department of Agriculture defines as a region void of fresh fruit, vegetables and other healthful whole foods. In the last few years, a movement has grown to improve nutrition on Fort Belknap by spearheading projects like community gardens and grocery stores. Nicole’s uncle, Raymond Gone, grew up in the 1960s in Hays when it was a booming small town with three grocery stores, a theater and pool hall. Residents had gardens that were a quarter acre or more that provided their family with fresh food for themselves and their neighbors. “It was good back in those days. Nobody was broke, nobody was rich,” Raymond Gone said. 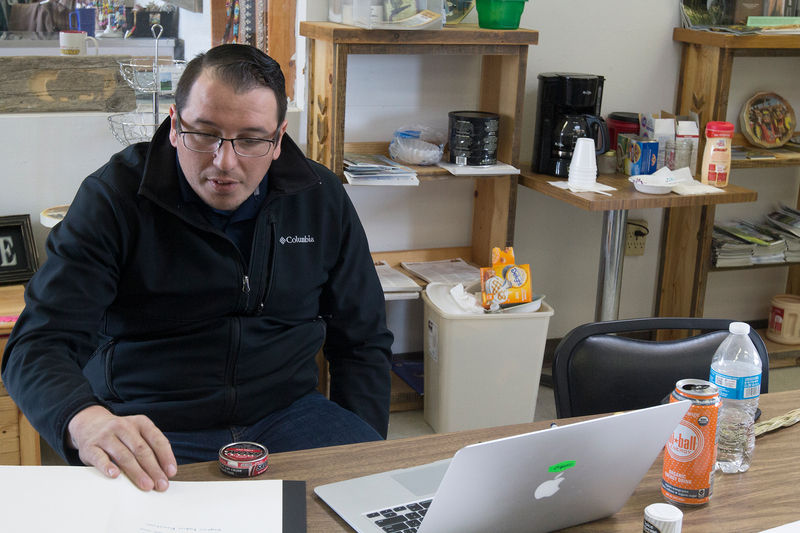 Eventually, he said, people started to move north to Fort Belknap Agency for jobs with the Bureau of Indian Affairs and the Indian Health Service. The local stores in towns like Hays and Lodge Pole closed. Nicole Gone, who is a member of the Gros Ventre tribe, grew up in Hays where her family relied on canned food provided by the local Food Distribution Program on Indian Reservations, which provides USDA certified foods to low-income households. Her parents, who were not diagnosed with diabetes at the time she was, knew little about the disease and its causes. Having grown up in large families, her parents often went to bed hungry, later raising their kids with plenty to eat, even if a majority of their diet was made up of food commodities. Because of a lack of resources and diabetes education, Nicole Gone’s parents were unaware of the high risk of diabetes in their family, and did not monitor portion sizes, sugars or carbohydrates. Today, Nicole Gone tries to educate herself about nutrition. But it’s hard to shift to better eating habits when stores on the reservation lack a variety of fresh produce. The only grocery store in Hays offers gas station food — eggs, bread, milk, soda and brightly packaged chips and cookies. The nearest grocery stores off the reservation are at least two hours away round-trip, and stores like Walmart or IGA in Havre, Montana, are about 180 miles away from towns like Hays and Lodge Pole. But the Assiniboine and the Gros Ventre tribes who live on Fort Belknap are taking matters into their own hands. 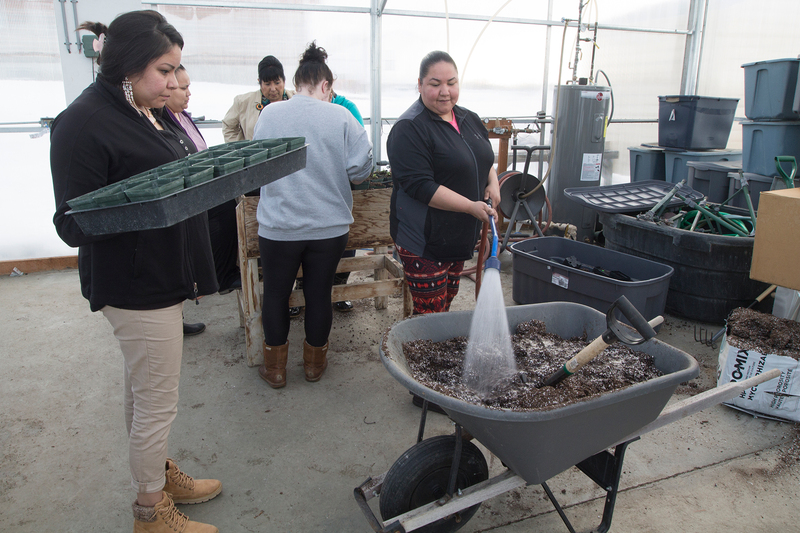 Students add moisture to the soil in order to have ideal soil conditions while transplanting their plants in Cheryl Morales’ ethnobotany class. In Hays and the Fort Belknap Agency, gardens were created so residents can harvest the vegetables and fruits grown there. Nearby in Lodge Pole, a new grocery store is set to open in May with a garden and orchard. Native Americans have the highest rate of diabetes among all U.S. racial and ethnic groups, nearly 16 percent, according to the American Diabetes Association. Jennifer Show of the Assiniboine tribe, is the diabetes coordinator and nurse practitioner for the new diabetes clinic that opened January 2018. The clinic provides one-on-one guidance for those who are at risk of developing diabetes or who have the disease, and provides patients with individual dietary plans and exercise routines. A frequent concern that residents have is being able to afford healthy produce. The unemployment rate on the reservation has more than doubled from 2012 to 2015, according to the 2017 MSU Extension Fort Belknap Reservation Poverty Report Card. Many people on the reservation receive food commodities from the federal food program. According to Linda Howard, the marketing officer for the Montana Department of Agriculture, the program distributes 75 different food items, and a majority are canned fruits, vegetables, frozen meats and dry goods, such as cereals and pastas. In a national study published in 2016 by the USDA about the federal food program, 38 percent of households use the supplemental food package as their primary food source. Fresh fruits and vegetables were introduced in 1998, and are delivered from a farm in Idaho every month. Trisha Black Crow, the acting director and certifying clerk at the FDPIR food commodity distribution center, said the produce is first come, first serve. “It’s a two-hour drive up and back for groceries, and a lot of the time [residents] don’t even have gas to come down here to get their commodities,” Black Crow said. In January and February 2018, the center distributed food to 487 households, which averages to about 550 participants for each month. Currently, the center delivers food orders to families who are unable to pick up their commodities, usually delivering to about 90 households total. Now, the center offers low fat bakery mixes, low sodium canned beans, unsweetened fruit juices and frozen meats. In the same study by the USDA, 90 percent of survey respondents were satisfied with food packages, including freshness, quality and nutritional value. In the past, Show said, there were fewer food options at food distribution centers, where a majority of the items were canned meats that were high in fat and sodium and canned fruits in thick, sugary syrups. When the program first started, there were about seven different items to choose from. “There is kind of this link between what was being given in the past to what kind of has developed now, which is we basically have an epidemic of diabetes. Not just here, but in Indian Country,” Show said. For dinner, Gone prepares bison stew and biscuits. The bison meat and the flour for the biscuits were provided by the food commodity program when she was enrolled in the winter. Now, she’s enrolled in SNAP, but still relies on the basics from the food commodity program that she saved over the past few months, like flour, canned goods and meats that are easy to preserve. Most nights, Gone makes dinner from scratch, saying that it’s healthier than making a packaged meal. Jim Kennedy, the store manager of the Red Paint Creek Trading Post and Pantry reviews plans for the store which is set to open this May. Before being hired as the manager Kennedy served Fort Belknap as a tribal councilman. Val Ricker, a licensed nutritionist and diabetes educator for the new clinic, says the food commodity program is meant to supplement a household by supplying a percentage of what a person is recommended to consume. For example, the USDA recommends that a teenage boy eats about 90 servings of vegetables each month. The food commodity program provides about 25 percent of those servings each month for each person. Ricker wants to show people that it is possible to eat healthier with cheaper foods or products from the food commodity program. A one pound-package of beef from the food commodity program can last longer by adding beans, a good source of low fat protein. To Ricker, making things with ingredients at home is more nutritious than making a boxed dinner with preservatives. In the center of Hays, nestled within mobile homes, the local church and post office, a two-acre park holds the dried foliage of last year’s harvest. In the community garden, brown tomato stems droop over their cages in the dilapidated hoop house and small apple trees in the orchard stand bare. It’s the beginning of April, and the local MSU extension agent is hosting another weekly meeting, discussing the next steps for the community garden. Hillary Maxwell, the local MSU extension Fort Belknap family and consumer science agent, knows that the sight of the park can be daunting. Her role is to host meetings that keep the community involved in food sovereignty efforts. The winter was especially hard this year in Fort Belknap, and plans to start working in the garden were pushed back. But she knows the community will clean up the garden in time for growing season. Hays residents Craig Shambo and Chris Ballard are avid participants in the garden. Shambo has helped locals till their gardens, while Ballard recruited a youth group last year from Miles City to help clean up the park and garden for the summer. The group believes society has reached a point of comfort where people don’t want to go back to starting gardens, and many rely on stores and fast foods to sustain themselves. But Maxwell is determined to reach the youth in the classroom. Nicole Gone watches as her youngest son Wamni Wa practices walking through the kitchen. Gone cares for five children in her home and encourages them to be active and eat healthy to prevent them from developing Type 2 diabetes. In a fifth grade class at Lodge Pole Elementary School, garden education has been going on for weeks. Small pots with seedlings line the window sill, bearing each student’s name. Students read from a booklet about the meaning of the term “organic” and about the history of eggplants and their discovery by Europeans, who thought the vegetable resembled an egg in the 18th century. Maxwell passes around a styrofoam cup with soil, explaining the properties of alkaline soil, which is least effective in growing vegetables. To finish the class, she passes out an eggplant salsa she made. According to Maxwell, about 20 personal gardens have popped up around Hays since 2016 when they started the community garden and park. Nicole Gone attends weekly meetings with the MSU extension program, and has learned enough to start her own bed of tomatoes, celery, lettuce and carrots in her backyard. This summer, Maxwell will provide Gone with seeds and information like the amount of space needed to grow certain vegetables and when to start planting. In the northern part of the reservation, gardening has taken hold in Fort Belknap Agency at the Aaniiih Nakoda Tribal College. In the large greenhouse, a group of students in an ethnobotany class study a variety of plants, using soil moisture sensors and transplanting the leafy seedlings to larger pots. There are medicinal herbs such as peppermint, plantain, yarrow and feverfew. Seedlings of lettuce, tomatoes, lavender, broccoli, hyssopus and others finally reach the top soil. The college’s demonstration garden has been a successful project since 1998, producing harvests ranging from lettuce and carrots to zucchini and watermelons. Manuel Morales, the USDA program director and tribal extension agent at the college, is the main gardener and donates vegetables and fruits from the two-and-a-half acre demonstration garden to locals in Fort Belknap. “We try to make it so that the people can see that we can grow anything here. That we can grow okra. That we can grow watermelons and carrots. You name it, we grow it,” he said. A small group of people gather in a small gymnasium in Lodge Pole, where each person is a vital piece to the growth of the new Red Paint Creek Trading Post and Pantry in Lodge Pole. The 5,300 square foot co-op consists of a convenience store, food pantry and commercial kitchen. Outside near the store, there is a 10,000 square foot garden, greenhouse, hoop house and orchard. Nicole Gone looks out her kitchen window to her backyard where she hopes to have a raised bed garden of her own. Gone regularly attends community gardening events in Hays, Montana hosted by MSU Extension Agent Hillary Maxwell. Development for the store started in 2014, when a food sovereignty assessment funded through the First Nations Development Institute revealed that residents in Lodge Pole were concerned about the lack of access to fresh foods and grocery stores. Leslie “Josie” Cliff, who is an enrolled member of the Assiniboine tribe, is the executive director of the Fort Belknap Community Economic Development Corporation and project director of the trading post and pantry. She has experienced this obstacle, and when she travels for groceries, she must take a cooler and freezer bags to keep refrigerated and frozen items cold as she makes the commute home from the store. “I think [the store] will have a huge impact because I think people, even myself, get really tired of having to drive, not only to Harlem or Malta, but to Havre,” she said. When it opens in May, the trading post will be the first store in Lodge Pole in 20 years since the closing of Beck’s General Store, which operated from 1985 to 1999. Jim Kennedy, an enrolled member of the Gros Ventre tribe, is a former Fort Belknap tribal councilman and current store manager of the trading post and pantry. In the future, he hopes to develop a youth market program with the store’s garden and orchard, which would teach youth about the nutritional and economic benefits of gardening. 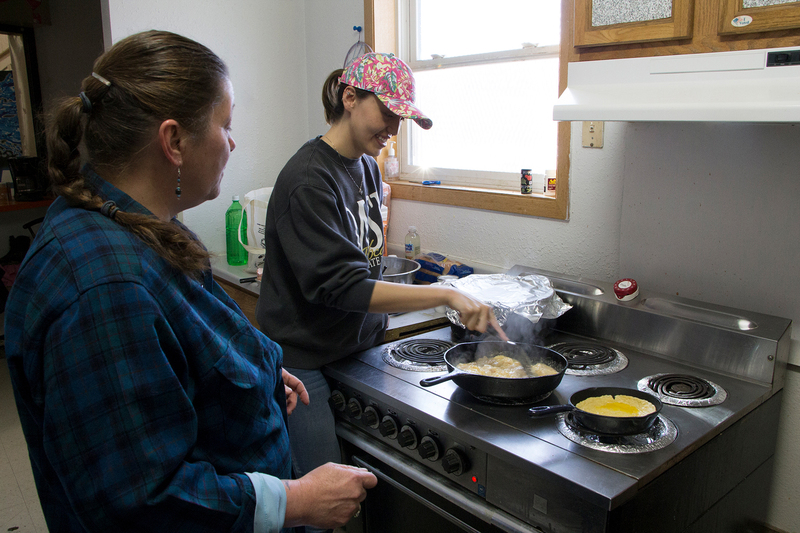 Hillary Maxwell (left) and Ramona King (right) prepare breakfast for the community meeting in Lodge Pole on March 26, 2018. Locals met at the Enemy Killer Recreation Center to discuss the opening of the Red Paint Creek Trading Post and Pantry. Kennedy started teaching his son gardening through his involvement in the store. At home, his son planted lemon squash, radishes, lettuce and beans. The First Nations Development Institute provides grants to assist Native communities with their local food system. Reservations have started farmers’ markets, gardens, grocery stores and more. According to Jackie Francke, the vice president of programs, more investment could mean a decrease in child food insecurity, diabetes and the revival of traditional foods and economic opportunities. More options for better eating is what Gone is looking for. 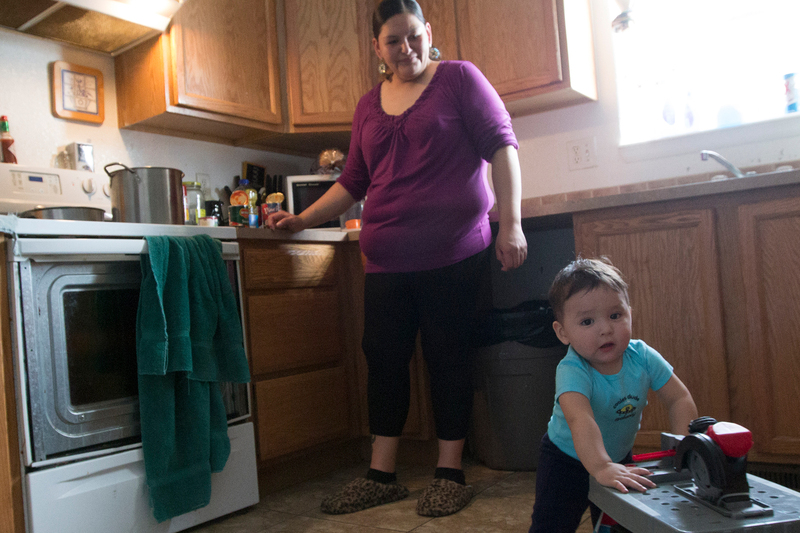 With more variety and education on the reservation, she is confident that her kids will grow up being more aware of their risk of developing diabetes. When she was first diagnosed, she developed a skin condition that darkened the skin on her neck. She takes her kids to get checked if she suspects they are developing the same skin condition. Gone realizes that living with diabetes requires constant monitoring of sugars and being on medication, and with the current food movement in Fort Belknap, she is confident that she can teach her kids to grow up knowing about the food they eat.